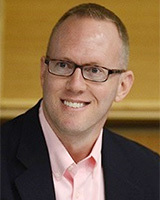 Jeff Niederdeppe, PhD, is an Associate Professor in the Department of Communication at Cornell University. His research examines the mechanisms and effects of mass media campaigns, strategic health messages, and news coverage in shaping health behavior, health disparities, and social policy. He has published over 130 peer-reviewed articles in communication, public health, health policy, and medicine journals, and his work has been funded in recent years by the National Institutes of Health, National Science Foundation, U.S. Department of Agriculture, U.S. Environmental Protection Agency, Robert Wood Johnson Foundation, and Town Creek Foundation. He received the Early Career Award in 2016 from the Public Health Education and Health Promotion Section of the American Public Health Association and the Lewis Donohew Outstanding Scholar in Health Communication Award in 2014 from the Kentucky Conference on Health Communication. He is an Associate Editor of Communication Methods and Measures and serves on the editorial boards for eight other journals. Dr. Niederdeppe received his PhD from the Annenberg School for Communication at the University of Pennsylvania.